Florence is full of beautiful art and architecture, especially from the renaissance period. There is so much to see in the city, even if most people visit only the better known monuments in central Florence. If you have a little time, you can go around to discover some other treasures of the city. This post is about some of the lesser-known but wonderful places of Florence. The image above shows an overview of the famous Old Bridge of Florence seen from the Michelangelo Square on the hill of San Miniato. Michelangelo square in Oltrearno (Beyond Arno river) is one of my favourite places in Florence. This square was designed by Giuseppe Poggi in the 19th century. From the Old Bridge and central Florence, you can see the San Miniato hill and the Michelangelo square on the top. If you cross the bridge and walk along the Arno river, shortly after Poggi monument, you will come across an old tower of a water mill. Just behind the tower, you will find the a road and the stairs going up to Piazza Michelangelo. It is not a very high climb and has a good road going right till the top, if you don't want to do the stairs. It is a huge square with a copy of the famous David statue by Michelangelo at its centre. From the square you can see beautiful panoramic views of Florence city as well as of the surrounding hills and the Tuscany countryside. If you do not wish to climb the hill and you have some time, you can find a public bus near the Santa Trinità bridge, which will take you there. Not very far from Santa Maria Novella square, if you walk towards Arno river, you will come across Piazza Ogni Santi (All Saints Square). This was the area of the wool merchants in medieval Florence. In the 13th century this square was lined by washing tubs for wool-dyeing under the Humiliated Friars who had built the San Salvatore church and Monastery in this square. The sculpture of a man fighting a lion in the All Saints square is by the well known Florentine sculptor Romano Romanelli. It was placed here in 1935, during the years of fascism. Holy Trinity (Santa Trinità) bridge with its beautiful statues is a good place for a view of the Old Bridge and the river. Near by are the tiny Santa Trinità square and the eponymous church. The square has a column with a statue of The Goddess of Justice. The Santa Trinità church has some wonderful paintings and frescoes - the whole wall behind the altar is covered with colourful frescoes. Florence has many big squares where the narrow streets of the medieval town can expand and take deep breaths. The Republic square (Piazza della Repubblica) is another of these big open spaces, not far from the Duomo Square and Lords' Square. It is a market area. The image below shows the Republic Square with the Christmas lighting. It is a good place to sit down, have a drink in one of the roadside caffes and to observe the local life. It also has a beautiful merry-go-round for children. Dante Alighieri born in 1265 CE is best known for his epic poem Divine Comedy. 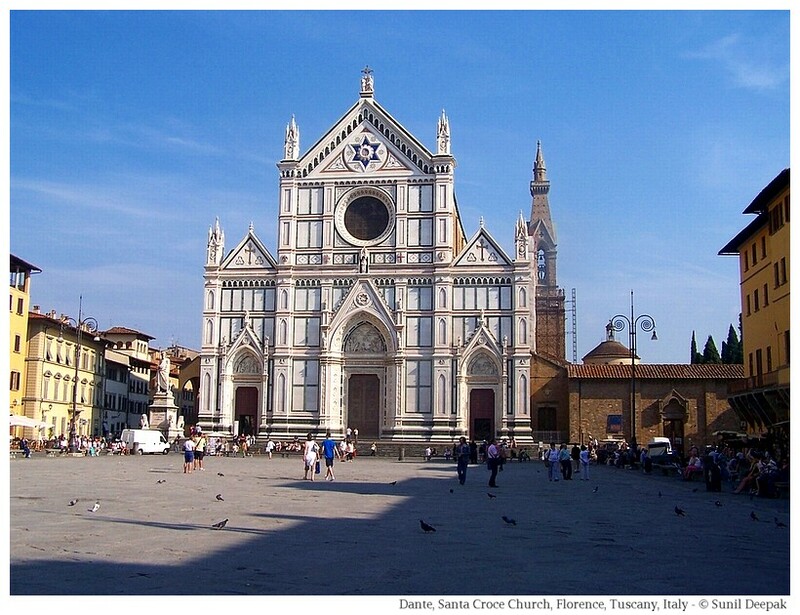 Dante lived in the Holy Cross (Santa Croce) area of Florence and is buried there. The beautiful Santa Croce square has a Dante monument and is dominated by the Santa Croce church, built in white marble and dark green granite. His grave is next to the church. 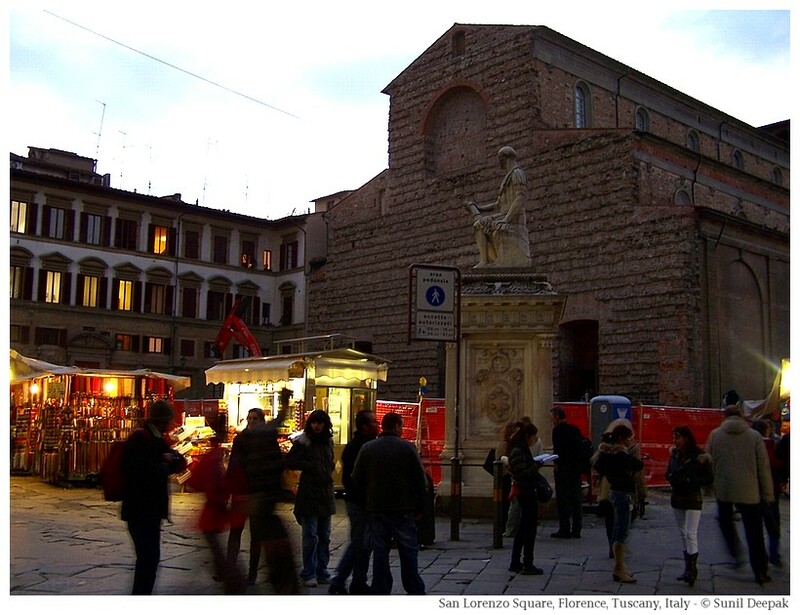 You can also walk to Dante's house on Via Dante near the Santa Croce church. It has a museum dedicated to him. Our next stop is Annunziata square (Piazza Santissima Annunziata) along the Via dei Servi near the Duomo (Cathedral). On one side, the square has the Annunziata church (Basilica). If you have time, visit this 13th century church. It has a lovely Pietà sculpture by Baccio Bandinelli, who was a friend of Leonardo da Vinci and hated Michelangelo. It has also has different paintings by important artists. Behind the church, a short walk away, there are the botanical gardens (Giardino dei Semplici) of the University of Florence. 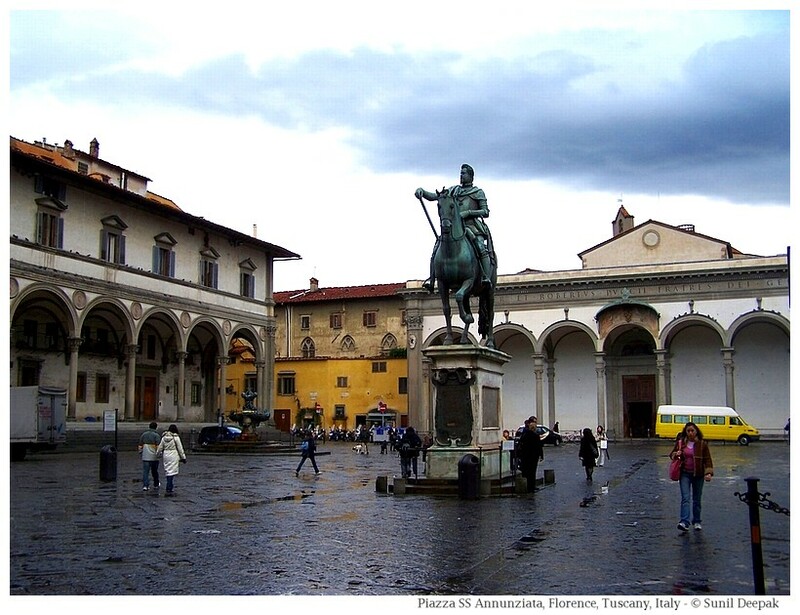 Annunziata square has a bronze statue of the Grand Duke of Florence, Ferdinando I, by the sculptor Giambologna (who had designed the semi-circular arches of the St Peter's square in the Vatican city) and his student Pietro Tacca. The square also has a fountain from 17th century in the Mannerism style, with a fantasy alien figure. I like the Mannerism style in sculptures, with their disproportionate bodies that look so graceful, and which probably inspired artists like Modigliani. Finally the square also has the fifteenth century Innocenti Hospital designed by Brunelleschi, that now hosts an office of UNICEF. It is a beautiful building with some interesting frescoes inside it. This square is also mentioned in the biography of famous Indian artist Amrita Shergil, who had stayed here for some time. If you walk from the Via dei Servi towards the railway station, you will come across the magnificent San Lorenzo church. This is one of the oldest churches of Florence. The seminary next door has a museum and the tomb of the St. Lawrence. The area around the church has shops, a bustling open air market and restaurants. It is a great place for its ambiance, to sit, relax and watch the life pass. There is so much more to see in Florence, apart from the well known places mentioned in the tourist books. If you enter in any church or walk through the city's squares or its gardens, and you will find much to inspire and to admire. I have been to Florence many times. Though I still love walking through its famous monuments like the Duomo Square or the Old Bridge, I also try to visit some of its lesser known places. In conclusion of this post, above you can see an overview of Florence, Arno river and the surrounding Apennines mountains from the Michelangelo Square. Nice to read. So beautiful pics.